As of this month, May 2012, Japan has no nuclear power for the first time in four decades. Just over a year ago—before the Fukushima disaster caused by the earthquake/tsunami—nuclear supplied 26% of Japan’s power. Taking all 54 reactors offline have left Japan with an “electricity black hole,” according to Thomas Drolet, President of Drolet and Associates Energy Services, Inc., a nuclear energy expert who has visited both Chernobyl and Fukushima. “And Liquid Natural Gas will certainly play a major role in this scenario as Japan scrambles to keep the lights on,” he says. Drolet estimates that Japan will want to increase LNG imports a further 2 billion cubic feet per day (bcf/d) on top of its already record imports in the coming two years. And the need for power is so acute, they just can’t import it fast enough. Japan imported a record 6.6 million tonnes or 11.5 bcf/d of LNG in April 2012. While you hate to profit from someone else’s misfortunes, this is bullish news for the three LNG projects—one of which is now under construction—on Canada’s west coast. It’s also bullish for the LNG shippers, where one year contracts are now being signed at $150,000/day—up from $40,000 only 18 months ago. 1. The three Canadian LNG proposals total 2.9 bcf/d (and those export terminals and ancillary services (pipelines) would cost roughly $10 billion in infrastructure). 2. In the US, that would be a full 50% of Cheniere’s (CQP-NASD) Sabine Pass LNG terminal, the largest LNG export facility that’s being planned in the US (so far). 3. Most LNG carriers can hold just under 3 bcf, so roughly new 17 ships (at roughly $200 million apiece) would be needed to make the trip from Australia or Canada to Japan. But the prize is huge—natural gas in Japan is now just over $18/mcf. That’s a great profit margin when gas is $2.25 here in Canada. Drolet says the most likely path to restore power to Japan will be that some of the nuclear reactors will come back online. He believes that about 25 of the 54 reactors will be reactivated gradually over the next 12-18 months (starting with this summer’s air conditioning and industrial peak demands). But due to anti-nuclear sentiment among the Japanese people, and the government’s and several utilities’ commitments to other fuel sources, he doesn’t expect any more than that. In this partial return scenario, he envisions that Japan will still have a 20,000 Megawatt equivalent (MWe) power deficit. He predicts that 15,000 MWe will likely come from LNG, with the remainder made up of 4,000 MWe from coal and a small amount (1000 MWe) of base load Geothermal power. “Energy planners don’t want to put all their eggs in one basket,” he said. 15,000 MWe equals roughly 2 bcf/d. Prior to the March 2011 Fukushima disaster, nuclear power accounted for 11% of total ‘energy’ consumption in Japan–but was 28% of electricity production, according to Unit Economics. Following the incident that number has dwindled until it finally hit zero early in May 2012. This has caused a substantial energy shortfall with some major utilities, such as Kansai Electric – which provides power for Osaka, Kyoto and Kobe – saying they will not be able to meet demand. Due to this the country’s government is urging people and businesses in parts of the heavily industrialized west to cut their energy usage by 15%. Talk about austerity! Even before the nuclear plants were taken offline, LNG accounted for 17% of Japan’s energy consumption. In 2010, this amounted to 70.7 million tons (about 9 billion cubic feet per day) of LNG—making them the largest importer in the world. In the 12 months ending March 31, 2012, imports totaled 83 million tons. If LNG were to take the entire 11% of Japan’s energy needs vacated by nuclear power, that would theoretically mean that the country has to import an additional 45.7 million tons per year—or 6.5 bcf/d—of LNG. Drolet suggests this is highly unlikely. Even if the Japanese decided to completely replace nuclear power with LNG, Japan does not have the import capacity to do that. 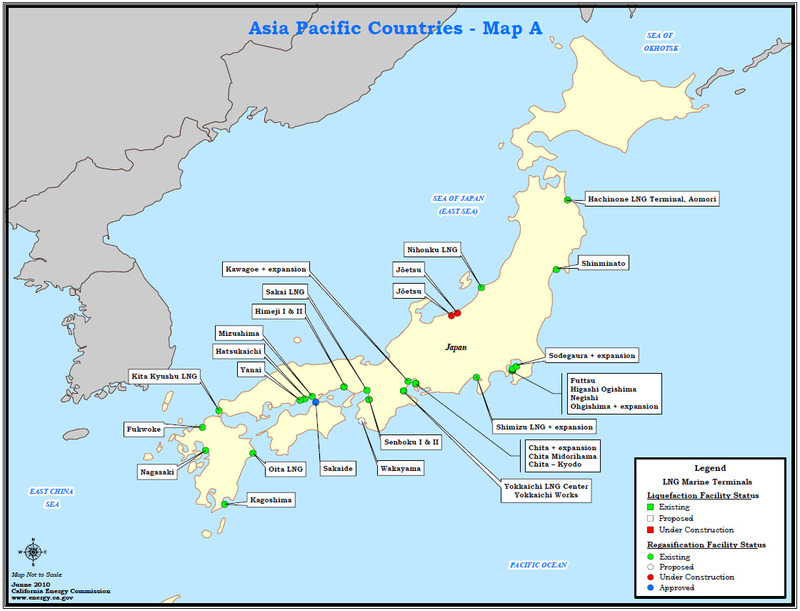 Japan currently has around 30 smaller import terminals that are located close to the areas that have the highest energy demand as pipeline and storage capacity are limited in the nation. According to Unit Economics, the country has roughly a theoretical maximum level 88 million tons per year (around 11 bcf/d) of LNG import capacity. NEXT STORY: The new technology innovation in LNG that greatly reduces costs and could fill Japan’s dire power needs much more quickly than ever before. There have been some shocking, obvious impacts in Japan after the Fukushima Daiichi nuclear disaster—and many others that are not so obvious. Nuclear expert Thomas Drolet, President of Drolet and Associates Energy Services, Inc., has visited the country dozens of times over the past decades, and three times since the March 2011 disaster. 1. One of the most obvious signs of this lack of energy is that nights in Tokyo are now much darker. 2. He said that Geiger counters are now a common sight in grocery stores as people make sure that they aren’t buying food with radioactive particles. 3. In addition, he said that his Japanese friend’s wife inspected him with the Geiger counter before he entered their apartment. 4. Japan is heavily reliant on air conditioning and last summer businesses were forced to turn their units up to 78 degrees or so, rather than the more standard 72, according to Drolet. This increased temperature led to many businesses allowing workers to shift away from the traditional suit dress code and begin dressing more casually. Drolet says that even when the fall and winter came, the less formal attire remained. In addition to these more aesthetic changes, Drolet says that the disaster also led many Japanese citizens to question authority more, as both TEPCO and the government were widely perceived to be less than honest with the public in the aftermath of the incident.